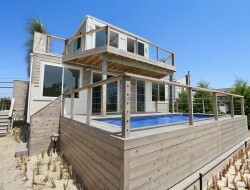 ‘The Hamptons’ are the summer and occasional weekend retreat for many of New York’s elite. Located on the eastern end of Long Island, houses regularly sell for $10 million and, sometimes, far more. The home featured here is a minnow having sold for a mere $1.4 million. But what is more unusual, is that it’s a container home. But for most of us, The Beach Box is the more realistic objective with its four bedroom, two and a half bedroom layout. Built off site by SG Blocks and shipped to the site, the home comprises six modules – four on the ground floor and two on the upper. Insulation is by way of spray foam internally and timber and fibre-cement cladding externally. The home also features low-E glazing and a thermoplastic roof and achieves a high energy efficiency. As a final consideration, there are enough unloved, empty containers sitting in ports to circle the Equator twice!